Stack’s Bowers Galleries is pleased to announce the Archangel Collection of Colonial and 1792 Coinage as a featured highlight of their October 2018 Official Auction of the Whitman Coin & Collectibles Expo in Baltimore. Comprising a comprehensive type set of early American and related issues, the cabinet showcases some of the greatest rarities of the era, from the Massachusetts silver coinage through the earliest U.S. Mint issues, all displaying exceptionally superb quality. Assembled chiefly in the 1970s and 1980s under the guidance of Stack’s, the Archangel Collection offers impressive provenances to many significant colonial coin collections, including those of David L. Spence (1975), Laird U. Park (1976), the Carter Brown Library (1976), the Garrett family (1979-1981), Doris and Ellis Robison (1982), and John L. Roper (1983), among others. The collection is currently being certified by PCGS and features extraordinary representatives of the iconic early American types including a 1652 NE Shilling (AU-50), 1776 Continental dollars of the CURENCY (MS-62+), CURRENCY (MS-62+), and EG FECIT (AU-58+) varieties, an MS-62 1781 Libertas American medal in silver, and high grade examples of the legendary 1792 Birch cent (AU-58), 1792 Silver Center cent (SP-45), 1792 half disme (MS-63), and 1792 disme in copper (AU-58+). 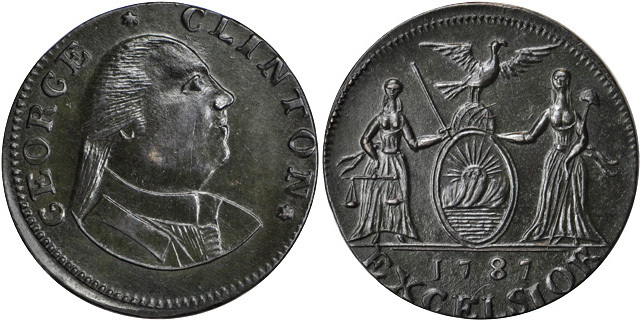 It also showcases the major rarities of this era including a Mint State 1694 Carolina PROPRIETERS Elephant Token, a Mint State 1760 Voce Populi Small Letters farthing, a Mint State 1787 George Clinton copper (MS-62 BN), a Mint State 1790 Standish Barry threepence (MS-62), and a Gem Proof 1792 Washington Roman Head cent (Proof-66 BN), among many others. This monumental offering represents the second opportunity the firm has had to present treasures from the Archangel Collection, having offered Private and Territorial gold coinage from this collection in November 2006 in conjunction with Stack’s sale of the Norweb Collection. At that time, incredible rarities such as an 1830 Templeton Reid $2.50, an 1851 Humbert $50, an 1849 Miners Bank $10, an 1852 Moffat $10, and an 1860 Clark, Gruber & Co. $20 crossed the auction block in an event that stands as a historic offering in the Private and Territorial gold field. 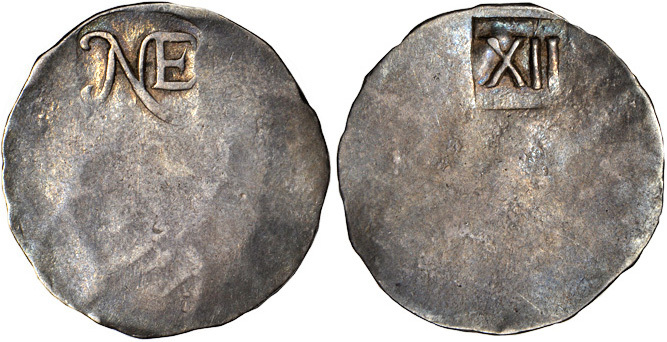 The sale of colonial and 1792 coinage from the Archangel Collection in the Stack’s Bowers Galleries October 2018 Baltimore Auction will be a similarly historic event in its field. It promises to draw the attention of the most sophisticated collectors who will compete for these prized rarities, which are coming to market for the first time in decades. For more information on this magnificent collection please contact Lawrence R. Stack at 516-456-1326 or Vicken Yegparian at 800-566-2580. Stack’s Bowers Galleries also invites collectors to take advantage of this opportunity and consign alongside the Archangel Collection in the October 2018 Official Expo Auction. The consignment deadline of August 28 is quickly approaching, so call 800-458-4646 today to speak with a consignment specialist. 1652 NE Shilling. Noe I-A, Salmon 1-B. Rarity-7. AU-50 (PCGS). 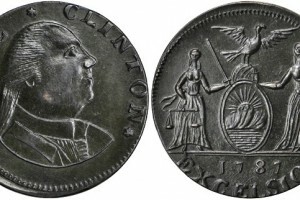 1787 George Clinton Copper. Rarity-7-. MS-62 BN (PCGS). 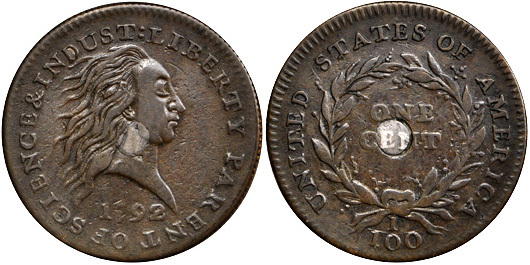 1792 Silver Center Cent. Judd-1. Rarity-6+. Copper with Silver Plug. SP-45 BN (PCGS). 1792 Disme. Judd-10. Rarity-6+. Copper. AU58+ BN (PCGS). 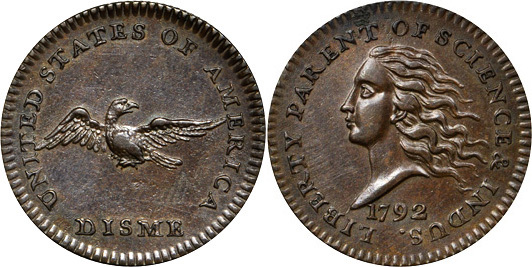 1792 Half Disme. Judd-7. Rarity-4. Silver. MS-63 (PCGS). 1786 Immunis Columbia/New Jersey Shield Reverse. Rarity-6+. Copper. MS-63 BN (PCGS).